Here at Andy Mohr Toyota, we are proud to be the Toyota dealer near Danville, IN, drivers go to for all their car buying needs. Our selection of vehicles is vast and diverse, and our team is committed to providing every person who walks through our doors with the exceptional service they deserve. Whether you’ve been in Danville for years or just moved to town, we’re here to help you get behind the wheel of your ideal new Toyota. Founded in 1824, Danville, IN, features a variety of historical attractions that make you feel like you’ve stepped back in time. From the iconic Twin Bridges to the Danville Courthouse Square Historic District, the city has tons of places that’ll satisfy any history buff. Of course, there’s more to love about Danville than just its historic attractions. The city is also home to a number of parks, like Blanton Woods. With over 50 acres of marked trails, it’s the perfect place to go for a fun-filled, outdoor adventure. Danville is filled with hidden treasures and things to do for everyone, regardless of what your interests are. You just need to make sure you have a great car if you want to explore it for yourself. Luckily, our Toyota dealer near Danville, IN, is here to help. Having a reliable vehicle won’t just make it easier to get around town; it’ll make your adventures more fun, too. 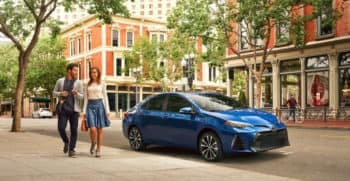 At our Toyota dealer near Danvers, IN, you’ll find many dependable new Toyota models, like the Camry, Corolla, and Highlander. Do you consider yourself to be an outdoor adventurer? Consider driving home in the Toyota RAV4. With tons of cargo space and a capable all-wheel drive system, you can travel through those back roads with ease and have enough room inside for your bike and camping gear. If you need an efficient car for your commutes, test drive the Prius or any one of our other hybrid models. They’re all equipped with advanced performance technologies, so you can get the efficiency you need without sacrificing the power you want. While every Toyota is great for all drivers, we know there’s nothing better than driving home in the vehicle that’s truly perfect for you. That’s why we’re always more than happy to help if you need assistance narrowing down your options. We’ll offer suggestions based on what type of car and features you want and provide you with the vehicle information needed so you can make an educated car buying decision. Plus, our team knows all about each Toyota in our showroom, so if you have any questions, don’t hesitate to ask! Our Toyota dealership near Danvers is also home to two helpful departments to make your life as a new car owner easier. In our finance department, our team of experts will work with you so you can get the finance terms you need. And if you’re interested in leasing, we’ll go over everything you need to know about our leasing programs. Need service or repairs for your new Toyota? We can help you with that, too. Just schedule a service appointment and take it to our service center, and our technicians will get to work. From routine maintenance and oil changes to parts replacements and extensive powertrain repairs, we’ll do it all to keep your Toyota in its best shape. The entire team at Andy Mohr Toyota is committed to ensuring excellent services for all Danville customers, no matter if you’re searching for your next Toyota or an oil change for your current vehicle. When you’re ready to experience our helpful services for yourself, or if you want to view our selection of new cars, visit our showroom or contact us today!